After placing Fan Cans recycling containers at M&T Bank Stadium, both Maryland Stadium Authority and Baltimore Ravens indicate favorable results and fan response. “Fan Cans are a great way for teams and corporate sponsors to show that going green is a high priority,” says Kevin Rochlitz, Vice President, National Sales & Partnerships for the Baltimore Ravens. Fan Cans, LLC is proving its ability to help sports stadiums and teams reach their fans and realize their sustainability goals – this time by taking an active role in the Maryland Stadium Authority and Baltimore Ravens recycling initiatives. 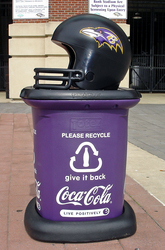 Since the introduction of the Ravens-themed Fan Cans at M&T Bank Stadium, the Maryland Stadium Authority has seen its average per event collection rate of recyclable materials more than double over last year’s average. Fan Cans is a line of 45-gallon recycling and waste receptacles designed to grab fan attention with lids shaped like baseball batter and football player helmets. Motor sports facilities and fans can look forward to the company’s newest container styled after a driver helmet, which is currently in the works. Fan Cans can be customized with any team and sponsor logos, and can be produced in any color. “Fan Cans are a great way for teams and corporate sponsors to show that going green is a high priority,” says Kevin Rochlitz, Vice President, National Sales & Partnerships for the Baltimore Ravens. “From a marketing standpoint, Fan Cans provide a unique way for teams and sponsors to engage fans - with increased green brand impressions and high fan appeal,” Rochlitz continues. All of the company’s 45-gallon receptacles utilize up to 50% post-consumer and industrial plastic, are highly-durable for expanded service life, and are 100% recyclable at the end of their life cycle. About Fan Cans, LLC Fan CansTM, LLC is a Maryland-based company that has designed and patented sports affinity commercial waste and recycling container lids, and has a strategic manufacturing relationship with Toter, Inc. Fan Cans is the recipient of SmartCEO’s “Eco Award”, and was nominated for the Baltimore Business Journal’s “Green Entrepreneur and Green Product of the Year,” in 2009. For details, please visit http://www.fancans.com.